Greetings Guys; I decided to start this thread as in the near future I'll be asking for opinions of value. As I will be helping my old friend's wife sell his bikes. And I'm working on getting 10 posts so I can post pictures next week. So keep your eyes peeled as I will need help & opinions. I do realize the info will be free & in life you tend to get what you pay for? But I'm hopping for the exception that your collective info will be better than my ability to pay. Stay tuned, Ole' Bob. If your friend's wife is selling locally (vs. ebay w/shipping etc), valuations need to be based on that area to have any meaning. For Alton, that's the Janesville / Beloit area of southern Wisconsin. As far as getting to the 10 post minimum for pix, an easy way is to visit the Intro section, and say hi to as many of your new friends in their posts as it takes to get to 10 for you. @VanRAH, here is a link to your Gallery/Album. One more post and you should be able to attach images normally. Hopefully people here will be able to help you with the value of your bikes, and perhaps some ideas on how/where to sell them. Does your bike say where it was made, and the tubing type? What about an inventory of the parts. Campagnolo Nuovo Record rear derailleur. 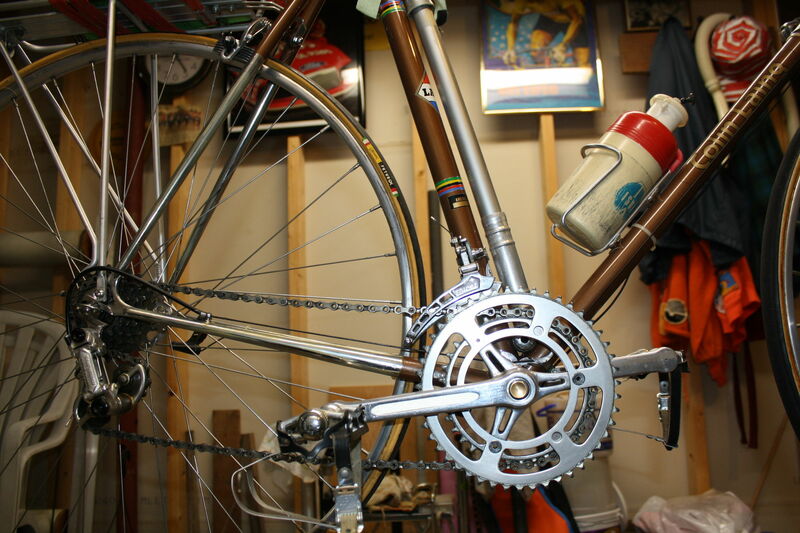 Huret front derailleur. Suntour bar end shifters. What else? That does appear to be a real gem. Yet, the market can be fickle too. Some of the less common brands in excellent shape can be very special. Yet, they may not pop up on people's searches. The mix of components looks well built, but can turn off some people. Greetings Clifford & all; So you are the guy with the skills to post pictures! Thank you, I have no clue how you did that. My goal for next week is to take a bunch of digital pictures of the tools (more on them later), my bike & most important my old buddies bikes - stuff. I have a meeting with his wife in the works for next week. We talked the night before last & she is running hot & cold. I think she is still in shock? As she is having a hard time with life & the decisions that come with a spouse dieing. So please give me some time to get this all together. Cliff you also have a good eye. I built the Laing to be the lightest bike of the day, It's 531! The wheels are only rated for a 135 Lbs rider (from memory). All the bearings are Campi (the very Best). Side note, I worked at Parker Pen making the balls, so I had access to some very accurate measuring equipment. Most new balls were JUNK. Only Campi would pass my inspection & I even found a few (very few) Campi balls that were less that perfect. The rear detailer is in a box (like new) as it just didn't preform very well. It also has a newer Campi titanium BB spindle with aluminum cups - tool steel races of course. Not pictured is the Ideal tan leather seat. I cleaned it up last night as it had some green mold on it around the rivets. I realized that it had been a bit over 20 years since I worked on bikes for spare money. A bunch of dust, dirt & dead bugs in my bike shop area. Well this will be my 10th post so I should be able to see my messages soon? Many of the tools will have to be included with the Laing, so I'll only be posting the ones not need to maintain it. I'm considering posting to Face book market place & Craig's List as I'm familiar with their format as time & pictures allow. So if it's OK here with the Mods, Will I be able to mention that I have posted to those formats? Please chime in. Thank you all for the help & suggestions, Ole' Bob. That Colin Laing is nice. It SHOULD be worth $800 to $1000, but the market is fickle, and I doubt you could sell it for $500, at least locally. Patience on E-Bay (and spending a lot of effort to pack it), and you might do a bit better. I'd much rather get a relatively obscure brand than a Trek that was made by the millions. But, it might be tough for people to find it. You'll also get beat up for having a mixed groupset. I hate to see bikes torn down, but in many cases the sum of the parts are worth quite a bit more than the bike as a whole. Especially if it is a little mixed (with quality components). Colin Laing value definitely eBay dependent. Locally might only get $300. Ebay could be 3X that amount, but requires pack and ship, fees, etc. This is the kind of bike I love to buy locally as there just aren't buyers for them (low price). Great as a buyer, lousy as a seller. Of course, I can't resell them locally as I am the only person that is interested in them. Will need better pictures, taken outdoors with a neutral background. Greetings Guys; Thank you for the feed back Clifford & wrk101. I didn't make time to post public last week. After conversing with Stan (Moderator-owner) & my buddies wife we came to the idea of buying a year membership starting April 1st (yes I know "April Fools Day"). That will give us April 2019 through March of 2020 to sell her-our bikes. I did get some basement pictures (still in camera & plugged into computer as I type this) & measurements. She wants me to start with posting the two custom Treks her 520 made from R 531 & his 760 also made of R 531. And later to follow his Fuji & another trek 520 made from True Temper? Plus I'll make some decision about what to do with my Colin laing & tools. I went down to the basement & started organizing stuff, but got no farther than a start. Memories & indecision have inferred! Along with helping here sell other stuff. Thank you for your interest guys, Ole' Bob. You're probably not going to be able to sell that for anything approaching real value in the Beloit/Janesville market. (I am familiar with both locales, having lived off what was then Exit 0 for four years). I'd advertise it up in Madison-- not that far anyway-- and possibly, if you want to range a bit afield, in Chicago. From what I'm seeing, it's a gorgeous and well kept bike. I think the 800-1000 is probably fair BUT I would start selling a bit higher (1200 or so) and be prepared to come down. American customs can be quite hard to price, but Laing is a better known name. That said, I see pretty nice American customs languish for months on end, even at what seems like (to me) bargain prices. I buy them fairly regular-like. So if you start high, don't absolutely hew to that price. But trying the waters is fine. Keep in mind my advice would be different if you were buying; I would probably tell you to work towards about 800 in that case. Greetings Poguemahone & all; Thank you for your post. Time isn't much of a factor. As my deceased friend & his wife hadn't ridden these bikes in years. And as far as the Laing goes it's been hanging for at least 4 or 5 years. I had cleaned & waxed it after a short ride back then. And found a very little bit of deterioration on some of the chrome so I polished it off & greased the chrome. That's why it looks so dirty as the dust just clings to the grease. Yesterday I got out the Reynold's 531 tube set that I had encased in grease-oil 25 years ago & put into a heavy tube. I haven't opened it yet. That's on todays agenda along with taking pictures of the set. And I have to get back down to the basement & finish sorting what might go & what to keep. That is very hard to do, because it means that I'm done "too damn old" & I don't really want to except that thought. Anyway I'm holding off posting anywhere (FB, CL) until I join here as I want to give you guys first shot at this unusual stuff. So watch for my posts around the 1st or 2nd of April. Thank you for the feed back, Ole' Bob. OB, don't give up; put a DIY electric motor on something. Greetings Guys; Well I tried to join this morning, but ran into a snag. It seems my card will be automatically billed again next year. Waiting for clarification from Stan. I did post my deceased friend's bikes to Craig's List Madison. And I may of exceeded the number of posts as the last one (3rd bike) has yet to appear (CL). At this point I won't go into detail as I haven't joined yet. Hopefully soon. Thanks for lookin, Ole' Bob. Sometimes it takes an hour or so for Craigslist to post your ad. Patience. I see all 3 of your ads now on the Madison CL. It looks like you have the Trek 720 priced at $950 and the 520 priced at $800. 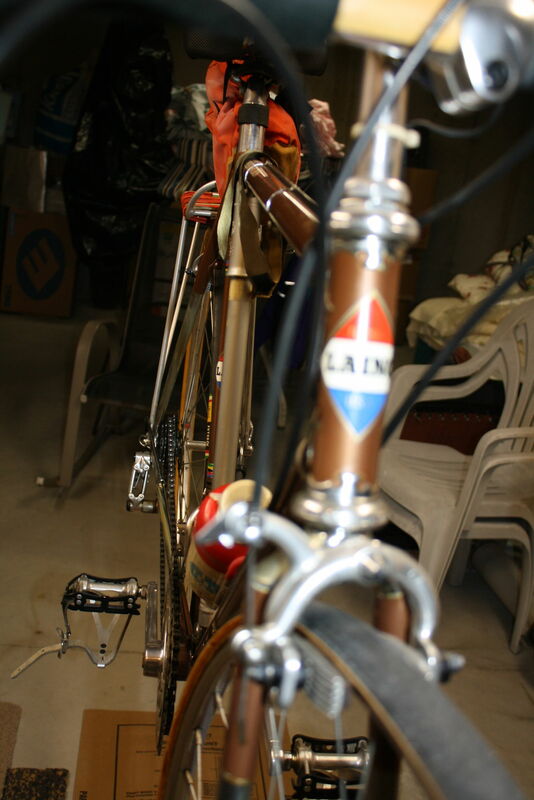 I'd be very surprised if anybody contacted you about them as there are always tons of Treks of similar vintage and quality on the Madison CL, being in the backyard of Waterloo, priced at $200-400. They're both very nice bikes but unless it's collectible like a De Rosa or 70s Paramount, getting more than $500 for a vintage bike is extremely unlikely in Madison. You can see there is a prolific seller who has Treks for sale right below your bike for around $300, and they are earlier TX models. 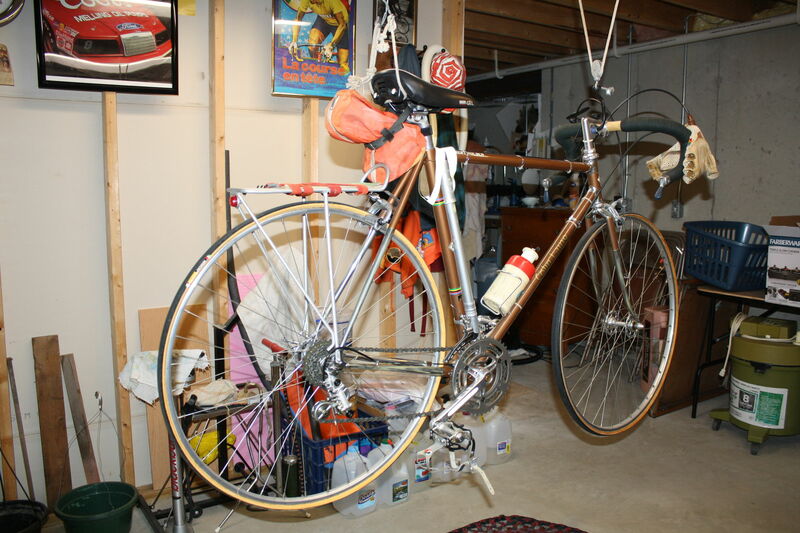 He has a few Reynolds 531 Treks for sale for around $350 and they have sat there for months. Thanks for the info TenGrain; Since they are not my bikes, I have to go slow & correspond with the owner. Our plan is to join here so I can post in for sale, SOON. And one can alway lower price in the future, but it's very hard to raise your asking price once many have seen it. I would imagine that one collecting a classic bike would be very fussy about size. The difference between art some Sunday use? I just got pictures of my Reynolds tube set & Nervex (how do you spell-lugs?) lugs, they have been sealed away for 25 years. What do you guys think I should advertise it for? Pictures soon. Thanks for the help, hope to be member soon, Ole' Bob. Trying to find out worth of 1989 Bianchi Brava?? ?